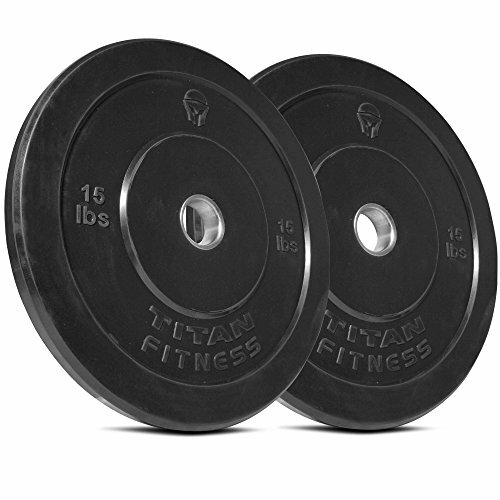 Titan Fitness bumper plates are excellent additions to any home gym! This set features a pair of 15 lb black rubber bumper plates. The 2" steel-lined center holes snugly fit Olympic size barbells and maintain their shape in between uses. We also offer 60" and 86" Olympic bars, plate and barbell storage trees, and power racks to push them up from. Dimensions: Inner ring diameter - 2"; Total diameter - 17 3/4"; Height - 1 3/8"
Quality design: Thick rubber plate is very durable; Steel internal ring is heavy duty and maintains shape.